Boeing (NYSE: BA) and Ryanair finalized an order today for 10 additional 737 MAXs at the 2017 Paris Air Show. LE BOURGET, France, June 20, 2017 /PRNewswire/ -- Boeing (NYSE: BA) and Ryanair finalized an order today for 10 additional 737 MAXs at the 2017 Paris Air Show. The order is valued at more than $1.1 billion at current list prices. The Irish low-cost carrier now has 110 unfilled orders with 100 options for the higher capacity 737 MAX 8, as well as 65 Next-Generation 737-800s. "We are pleased to announce this purchase of 10 additional Boeing 737 'Gamechanger' aircraft, on top of our existing firm order for 100 737 MAXs, with a further 100 options remaining," said Ryanair's Chief Operations Officer, Mick Hickey. "This all new MAX 737 aircraft has 8 more seats than our current 189 seat Boeing 737-800s and incorporates the latest technology engines and winglets which reduces fuel consumption and noise emissions, ensuring we remain Europe's greenest, cleanest airline. Ryanair is proud to partner with Boeing and has operated an all-Boeing fleet since 1994." Ryanair is an all-Boeing operator and launched the higher capacity 737 MAX 8 in late 2014 with an order for 100 airplanes. The airplane will provide Ryanair with 197 seats, increasing revenue potential and providing airlines like Ryanair with up to 16 percent better fuel efficiency per seat than today's most efficient single-aisle airplanes. "The 737 MAX with 197 seats provides Ryanair with the perfect solution for its additional capacity requirements as it strives to carry 200 million passengers per year by the middle of the next decade," said Ihssane Mounir, senior vice president, Global Sales & Marketing, Boeing Commercial Airplanes. "The 737 family has been the foundation on which Ryanair has revolutionized low-cost travel in Europe and we are honored that this iconic operator continues to grow in partnership with Boeing." Ryanair carried 120 million passengers last year with 1,800 daily flights to more than 200 destinations. The Dublin based carrier is the largest 737-800 customer in the world and the largest Boeing operator in Europe. 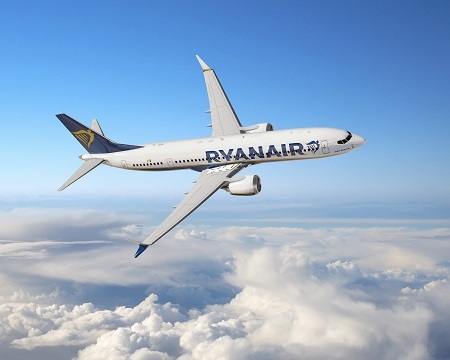 In March this year Ryanair took delivery of its 450th Next-Generation 737-800 and with today's announcement has ordered a total of more than 640 airplanes from Boeing.